Cameron, who loves to dance and play the drums wanted to get a little creative in the kitchen during half term. 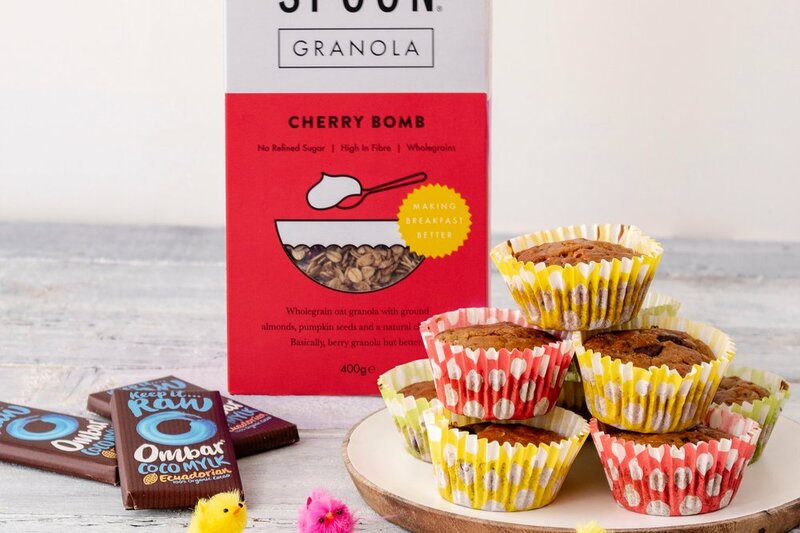 Together with his dad the two developed an Easter muffin recipe, which they can also enjoy on a day out or even to take to school and work. Prepare the cherries by taking out any stones and cutting them into halves or quarters. In a small bowl, mix the milk and apple cider vinegar until fully combined. Let the mix rest for about 5 minutes. In a bigger bowl, mix the flour, Cherry Bomb granola, sugar, baking powder and bicarbonate of soda. To the smaller bowl with the milk mix, add the melted coconut oil and whisk until well combined. Now add the wet ingredients to your dry ingredients and mix until it created a smooth batter. Break the Ombar chocolates into small pieces (similar to chocolate chips). Add to the mix. Now add the cherries and give it a quick stir. Fill the roughly ¾ muffin cases with the batter. Pop them into the oven at 180 degrees for around 20 minutes. Check them after around 15 as the baking time depends on your oven and how full your cases are. Once they are baked, place them on a cooling rack until they are fully cooled.